: As the name implies, “Manual Clean” centrifuges are designed for liquid/liquid separation of 2 immiscible liquids with no solids or very low solids contamination (&lt; 0.5% by volume). Typical applications include separation of water from diesel fuel; separation of water from turbine lube oil; biodiesel separation from glycerin etc. “Self Cleaning” Centrifuges have more extensive uses. They are designed for liquid/liquid/solid separation. Though these are “self cleaning” centrifuges, they can separate fluids with upto 5% (by volume) solids. Any ratio of the 2 immiscible liquids can typically be handled by these types of centrifuges. Typical applications include separation of crude-oil from salt-water and sediment; fuel oil separation from water and sediment; wvo separation from water and sediment; used motor oil separation from water and fine metal particles etc. We have a large Full Service maintaenance Shop to Carry out complete maintenance and Repair services for Centrifuges and Decanters of all Makes and Models Such as ALFA LAVAL, WESTFALIA, SHARPLES. We furnish full service, sales, parts, maintenance and start-up services. We specialize in fuel-oil treatment, waste-oil recycling, bio-diesel separation, hydraulic-oil clean-up and/or any other liquid/liquid/solid separation application. in aftermarket and genuine spare parts for Alfa Laval, GEA Westfalia Separators, and plate heat exchangers. We have grown from a spare parts provider to a thriving, reliable, global provider of spare parts and equipment. 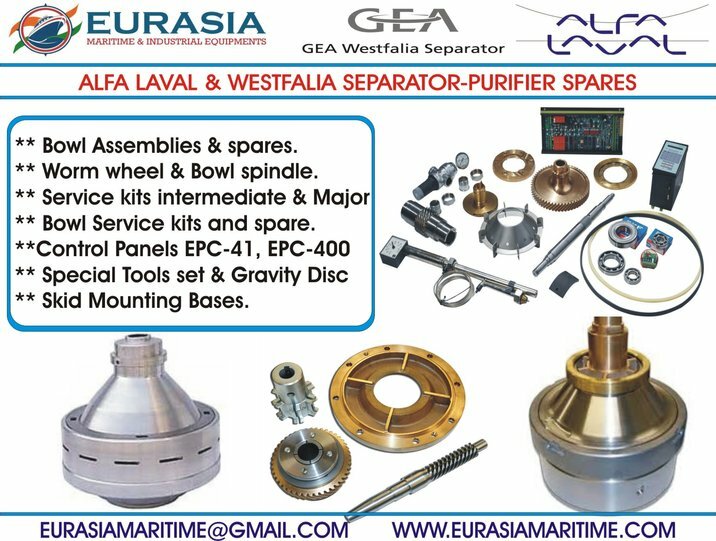 We are one of the largest and truly independent suppliers of OEM and aftermarket spare parts and services for Alfa Laval Separators and GEA Westfalia Separators. Separator Spares & Equipment, LLC is committed to providing the largest selection of spare parts in the industry and we are continuously increasing our inventory to meet the demands of our customers. All spare parts whether genuine or equivalent are fully compatible and carry a 12-month warranty on all non-wear items. All stock parts can be delivered next day and world-wide shipping is available. holds a large and varied range of fully refurbished centrifuges from most major manufacturers including Alfa Laval and GEA Westfalia Separator. new, used, second hand and reconditioned High speed separators, disc bowl and self-cleaning centrifuges for biodiesel, manufacturing, food, paper, automotive, chemical, environmental, marine, power, and factory utilities applications. These include Alfa Laval and other industrial separators for coolant recycling, metalworking fluid cleaning, lube oil purification, wastewater, dewatering, fish meal, oilfield drilling mud, grinding fluid filtration, waste oil recycling, wash fluid filtration and recovery. Self Cleaning Alfa Laval MAPX 204, MAPX 205, MAPX 207, MOPX 209, MAPX 210, MAPX 313 and MOPX 213 are very popular for Biodiesel. Rebuilt Alfa Laval MOPX 213 (Rated 93 GPM) self cleaning centrifuge for Biodiesel production. Suitable for removing small amounts of solids, magnesol, magnesium silicate, glycerine and water from more than one stages in the bio diesel making process and fuel purification. Biodiesel, Transesterification, FFA, Glycerin, Water removal manual clean and self cleaning, high "g" force disc bowl centrifuges. Alfa Laval MAB 103 MAB 104 MAB 204, MAB 205, MMB 305,MAB 206, MAB 207, MAB 209 centrifuges for hydraulic oil, lube oil purification, oil water separation. MAWA 10 Alarm for broken liquid seal for Alfa Laval Purifiers Alfa Laval design or integrated panel. Self Cleaning desludging centrifuge modules Alfa Laval MOPX 205, MAPX 205, MAPX 207, MOPX 209, MAPX 309, MAPX 210, MOPX 213, MAPX 313, Alpha Laval MAPX 204, WHPX 505, WHPX 508, WHPX 510, WHPX 513. Mars Tech offers a wide range of new and reconditioned high speed disc bowl centrifuges for cleaning, conditioning, polishing and filtration of mineral oils and lubrication oils used in power plants, marine installations, gas turbines and industrial oils. Alfa Laval solids retaining centrifugal separators are excellent for purification and clarification of mineral oils, synthetic oils in industrial installations and wvo cleaning..
Alfa Laval MIB 303 and Emmie 2, MIB 403 Emmie mobile High speed solids retaining centrifugal separator for diesel fuel purification on marine small boats, yachts, boats, tugboats and power plants. Turbine and diesel engine suppliers recommend centrifuges and related equipment to reduce harmful contaminants such as fine particulates, water, iron, sodium, potassium, calcium and magnesium from fuel oil, crude oil, crude blends, No. 2 distillates such as diesel and petroleum naphtha. 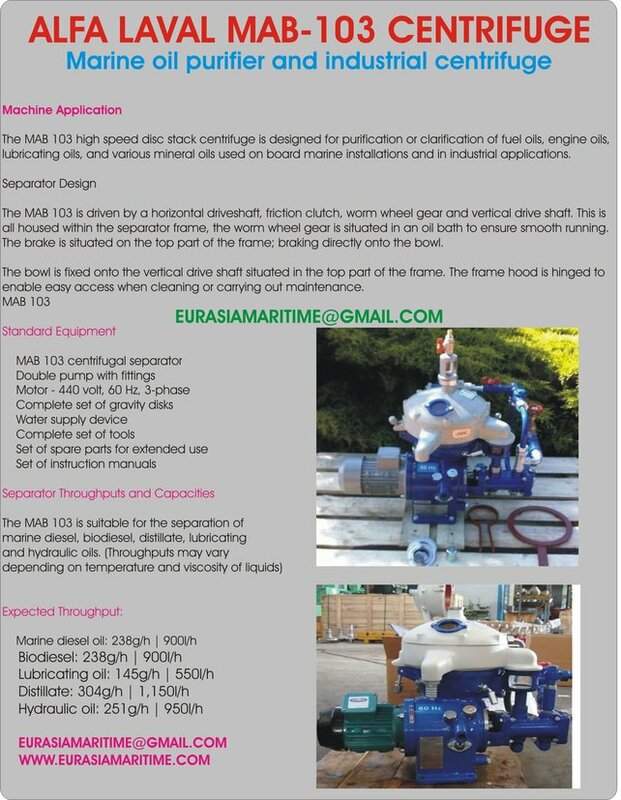 Successfully used over many years for separating water and particulate contamination in fuel oil, turbine lube oils, other lubricating oils, running -in, hydraulic, cutting,quench oils, diesel powered yachts, pleasure boats, small cruise ships, small boats, tugs, barges and fishing vessels..
Mars Tech has a simple and proven replacement for MAWA 10 Water Seal Alarm for broken liquid seal (breakover) for Alfa Laval Purifiers. It includes an integrated motor starter and liquid seal alarm in one user friendly control box. Separation takes place in a solids-retaining bowl that can be arranged for either clarification or purification. In both cases, the contaminated oil is fed into the separator through the center and it is separated by centrifugal force into various phases. The heaviest phase (sludge and water) is forced outwards to the perimeter of the centrifuge bowl. Clarifier Design is suitable for separating oils containing sludge and a very small amount of water. Purifier Design is suitable for separating oils containing sludge and an appreciable amount of water. The accumulated sludge is periodically removed from the bowl by hand. Higher capacity Alfa Laval MAB 204, MAB 205, MAB 206, MAB 207, MAB 209 are available. Alfa Laval OCM 103, OCM 104, OCM 304, OCM 305, OCU S-103 centrifuge purifiers are supplied complete with feed and discharge pumps, control panel and piping with or without a pre heater Oil Cleaning Module. Reconditioned Alfa Laval MAB 103 and MAB 104 purifiers are available at low prices for quick year end sale. Mars Tech STOCKS many New and Reconditioned Alfa Laval centrifuges. We offer Spare Parts at very competitive prices. APPLICATION : Oil Separators is used to Purify Furnace Oil / Diesel Oil / Lubricating oil / Hydraulic Oil, Virgin Coconut oil, waste motor oil, HFO,Transformer Oil, Bio Diesel, WVO And have numerous application in various industrial process as well. **We supply RE-CONDITIONED ALFA LAVAL CENTRIFUGES, Mitsubishi Kakoki - samgong and Westfalia oil purifier, industrial centrifuge, oil separators. MAB type Solid bowl centrifuge to handle low level of solid contamination. Cleaning of bowl done manually. Application in LO, Diesel & industrial fluids. MAPX – First generation of auto desludge / discharge centrifuge with a concept of total desludge – capable to handle medium level of solid contamination. Application in LO, Diesel, Bio-diesel, VCO, Waste oil HFO & industrial fluids. MOPX – Second generation of auto desludge / discharge centrifuge with a better bowl geometry and designed as total desludge. – capable to handle medium level of solid contamination. Application in LO, Diesel, HFO, Biodiesel, Transformer oil, waste oil, VCO & industrial fluids. WHPX – First generation of partial desludge centrifuge – capable to handle higher level of solid contamination. Application in LO, Diesel, HFO, Waste oil, Biodiesel & industrial fluids. FOPX – ALCAP design with a self initiated desludge. Basic unit is clarifier & purification effect achieved by water transducer. Operation is absolutely automated with EPC-400. Application is on HFO. LOPX – ALCAP design with a self initiated desludge. Basic unit is clarifier & purification effect achieved by water transducer. Operation is absolutely automated with EPC-400. Application is on LO. MMPX – A belt driven partial desludge centrifuge. Application in LO, Diesel, HFO & industrial fluids. EURASIAMARITIME@GMAIL.COM are suppliers and exporters of all kind of ALFA LAVAL SEPARATOR And its Spares. are suppliers and exporters of all kind of ALFA LAVAL & WESTFALIA SEPARATOR And its Spares. We supply all control systems used with Alfa Laval and Westfalia separators. Auto De-Sludging Centrifuge, is a disc type centrifuge in which a carefully designed system opens ports in the bowl periphery at controlled intervals in order to remove the collected solids. The sludge is ejected out instantly due to the extremely hi g-force at the periphery of the rotating bowl. These Alfa Laval centrifuges are also known as Self-Cleaning centrifuges. For what applications is an Self-Cleaning Centrifuge best suited? Due to the intermittent nature of the sludge ejection cycle, these self-cleaning disc centrifuges are best for application where the %sludge (%sediment) is < 5% v/v. At higher solid load levels the sludge ejection frequency increases to a point where the centrifuge efficiency starts getting adversely affected. At higher (> 5% v/v) sludge loads a Alfa Laval decanter centrifuge is recommended to de-sludge the fluid prior to a self-cleaning centrifuge being used as a polishing stage. In cases where there are no solids or the solids are negligible (< 0.05% v/v), a Alfa Laval Manual Cleaning Centrifuge maybe be used for separation of the 2-liquid phases. Any solids (down to 0.5µ) are separated as well and are accumulated in the bowl of the centrifuge for manual evacuation. Solids Retaining Centrifuge, is a disc type centrifuge in which the separated solids accumulate at the bowl periphery and need to be manually evacuated. 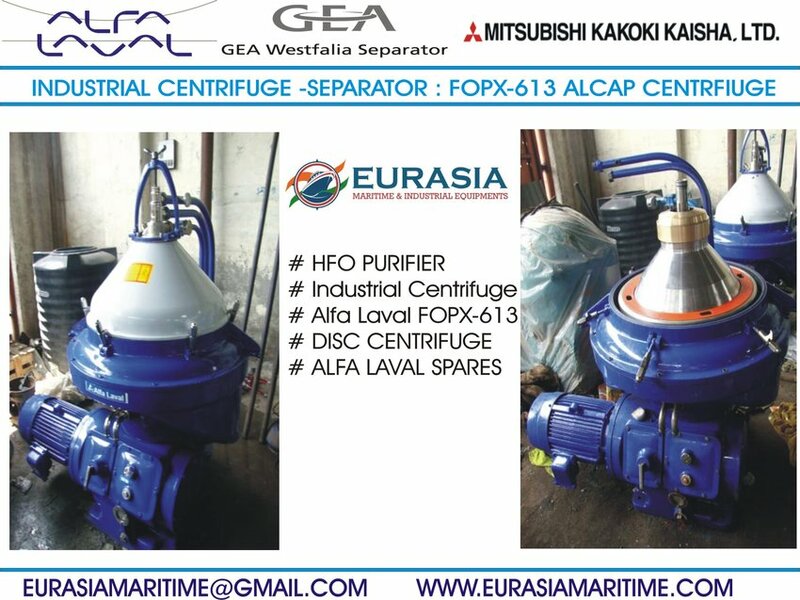 These Alfa Laval centrifuges are also known as Manual-Cleaning centrifuges or Solid Bowl Disc Centrifuges. For what applications is an Manual-Cleaning Centrifuge best suited? The sludge retaining design of the bowl prevents this type of centrifuge from being used in any application with appreciable level of solids, these manual-cleaning disc centrifuges are best for application where the %sludge (%sediment) is < 0.5% v/v. At higher solid load levels the time interval between sludge clean-out cycle is reduced to a point where centrifuge efficiency starts getting adversely affected. At higher (> 0.5% v/v) sludge loads a Alfa Laval ‘self-cleaning’ centrifuge is recommended. A Manual Cleaning Centrifuge is ideal for the separation of the 2-liquid phases. Any solids (down to 0.5µ) are separated as well and are accumulated in the bowl of the centrifuge for manual evacuation.